I made this Chevy Tahoe cake for a friend. 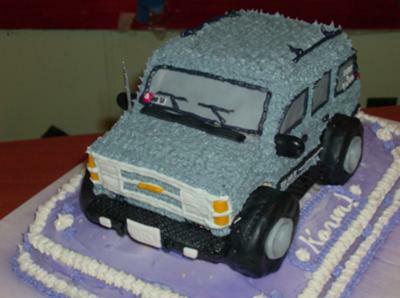 The truck is made out of pound cake, and the tires are pound cake covered in fondant. The rest, bumpers mirrors, windows, etc., are fondant also. The bottom cake is yellow cake mix. I have to say that is the best truck I have seen!!!!!! Join in and write your own page! It's easy to do. How? Simply click here to return to Cake Decorating Contest Submission Form.